Survey data released by Towers Watson and Aon Hewitt show that the widespread majority of employers plan to offer health care benefits to their employees in the future. Most employers, according to their surveys, do not foresee eliminating health plans, even in light of health care reform. Additionally, survey reports including those conducted by Towers Watson and the National Business Group on Health, project an average increase of 5.9% and 7% in health care costs (respectively) for 2013. Pricewaterhousecoopers projects an average increase of 7.5% for 2013. These projections are lower than past years, which suggest that employers can expect stable health care costs, at least in the near short-term. Locally, organizations' health care increases hover slightly higher around 10%, per ERC's 2012 ERC/Smart Business Workplace Practices Survey. This average increase remained stable from 2011. Meanwhile, the average split of employee/employer shares of the premium are 25% (average employee contribution) and 75% (average employer contribution), per the Workplace Practices Survey. Consumer-driven health plans are the second most common plan design offered by U.S. employers currently, according to a 2012 survey conducted by Aon Hewitt. Research conducted by other organizations, such as Mercer and the Employee Benefit Research Institute (EBRI) confirms that consumer-driven health plans are rising in usage. Similarly, a census released by America's Health Insurance Plans reports a rise in the number of individuals with health savings account coverage (HSA), with Ohio ranking fourth in terms of states with the highest HSA enrollments. ERC's surveys also confirm growth in HSA offerings by employers. Wellness programs continue to complement health insurance plans and be used by organizations to reduce costs. The use of outcome-based wellness incentive programs, onsite health clinics, onsite wellness or health coaching, and stress reduction/management are being increasingly used by employers to combat health insurance costs, per surveys conducted by numerous organizations, including WorldatWork, Society for Human Resource Management, Towers Watson, Mercer, and the National Business Group on Health. A number of national and local surveys show that flexible work arrangements have gained ground among employers. Flexible work arrangements were offered to more than half of workers in 2011, according to the Bureau of Labor Statistics, with the majority of employees being able to adjust their work schedule and/or location instead of taking time off work. The Conference Board also finds that more employees are able to work from home than in previous years. Other surveys have found that employers are becoming more work-life friendly. 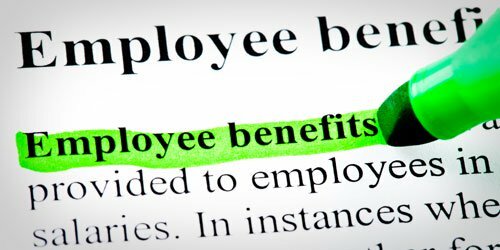 The Society for Human Resource Management's 2012 Employee Benefits Survey reports an increase in the percentage of employers offering flexible and support benefits. Specifically, the number of employers offering telecommuting is trending upward, as are paid time off plans which lump vacation, sick, and personal days into one plan. Another SHRM study, conducted in collaboration with the Families and Work Institute, reports that more organizations are allowing employees to use flextime, change their start and quit times within a range of hours, and have more control over their paid and unpaid overtime hours. Meanwhile, a survey conducted by Workplace Options found that 43% of employees reported an increase in employer-provided work-life benefits while 28% said these benefits have increased from 2007. More employees also report having greater access to assistance programs for child and elder care as well as legal and financial issues. Similarly, New Ways of Working (WOW) released a survey earlier in 2012 which showed that alternative work arrangements – such as mobile work, hoteling, working from third-party places, and telecommuting – are on the rise. From a local perspective, in our NorthCoast 99 program, we have seen similar trends, with more local organizations offering flexible scheduling options and to a greater number of individuals. In addition, the average number of employees eligible to participate in flexible scheduling options has risen over the past few years. Similarly, according to SHRM's 2012 Employee Benefits Survey, offerings of professional and career development benefits (i.e. mentoring programs, certification/recertification fees, professional memberships, etc.) among employers also appear to be rising. Meanwhile, another survey by Bersin & Associates in collaboration with HR Executive shows that U.S. companies have focused on and spent more on leadership development from 2011. Spending on high potentials, top performers, and leaders for leadership development has increased by 14%. Locally, we've also seen rises in spending and time allocated to the development of both employees and especially top performers in our NorthCoast 99 program in 2012. Much of this training is aimed at developing managers, leaders, and top performing employees. Based on our research, other benefits have seen less consistent or significant trends in 2012 when compared to health insurance, flexible work arrangements, and training and development. For these reasons, they are benefits to keep on your organization's radar in 2013. Be sure you have most up-to-date benchmark information on these benefits and are prepared to stay competitive. The survey is ERC’s single and most comprehensive source of both national and local policies and benefits benchmarking data. For more information, please email surveys@yourERC.com or call 440/684-9700. Budgeting for training next year? Hundreds of companies turn to ERC every year to develop and enhance the skills of their managers, supervisors, leaders and professionals at all levels in management, leadership, as well as technical and soft-skills. Save on Benefits, Wellness, & More! ERC's Preferred Partners offer discounts to ERC Members on benefits-related services and employee wellness.